Like any girl who graduated from high school, I love Harper Lee's To Kill A Mockingbird. Somehow, though, I never read it until I was in my mid-twenties. For me, it was almost less about the story than it was about the sweet, sweet characters. I wanted to give them all a hug. Also, I wanted to eat some scuppernongs. As you've probably heard, Harper Lee recently published a new book with those same characters. It's called Go Set A Watchman, and it's set in Scout's (now referred to Jean Louise) mid-twenties. I've read mixed reviews in which some cast a suspicious eye on the actual authorship of the book. Not being a Harper Lee scholar, I can't say whether I think they're true or not. I'm just hoping it was she who wrote the book. Whether or not Lee actually did write or authorize the release of this sequel, I quite liked it. It's not the masterpiece To Kill A Mockingbird is, but it does explore what the lives of the characters would have been like afterward and also manages to teach a lesson that's nuanced and a bit complex. I don't want to spoil anything for you, but I think you should read this one. Mostly I know you're waiting to hear how Scout turned out. Mini Spoiler: a now-adult Dill is discussed, and I love that. 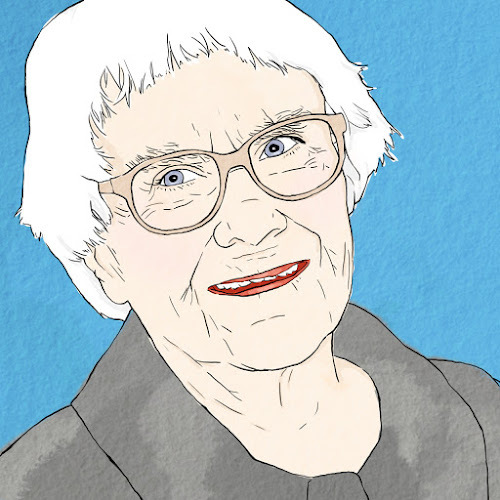 While I know we can't expect to receive a list of speaking engagements for a Harper Lee book tour, I - like everyone else - would jump at the chance to see her. I know she won't do it, though. This might be one woman who can actually fear being hugged to death. Thursday Fun: Color Your Own Paper Doll! A Finished Portrait and a New Website!